New Sins For Old Scores by Tj O'Connor is a thrilling and suspenseful murder mystery that spans over six decades. Detective Richard Jax receives a call from his partner, Leo, requesting Jax to meet him at an abandoned inn. Leo never appears, and Jax is ambushed and shot. When the ambulance arrives, Leo is found dead, lying next to Jax. Jax dies at the scene and is revived four times during the whole ordeal. Accompanying his resurrection, Jax acquires Trick as a new partner. Inexplicably, no one else can see or hear Trick. Trick claims to have been an OSS agent during WWII, who was betrayed and murdered at the same inn sixty-seven years ago. As Jax becomes accustomed to Trick's presence, he begins to consider that his assault and Trick's demise may be related. With Jax as the prime suspect in Leo's death, he is suspended. Unable to investigate Leo's murder, Trick and Jax work on unraveling Trick's assassination. They believe that the source of both murders is linked. Can Trick and Jax find the leads that tie the decades-old treachery and the present crimes together, and solve both cases? 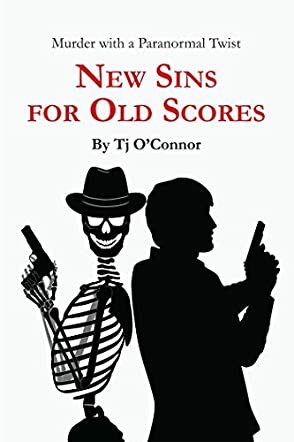 New Sins For Old Scores by Tj O'Connor is a scintillating murder mystery that holds the reader enthralled until its riveting conclusion. The plot is stimulating and well-written, brilliantly moving between the past and present. The exciting twists and turns within the storyline culminate in an astonishing denouement. Although Trick's personality traits were a little out of step with his era, his character is enigmatic and unforgettable. His idiosyncrasies and paradoxical history draw the reader in, furnishing another view of life during the war. This is a magnificent tale of espionage and betrayal that will captivate fans of mystery and intrigue.